Crowdsourcing Groundwater for resilient farming communities. Crowdsources data from a network of volunteers. MyWell allows anyone armed with a feature or smartphone to take part in science. Gives data back to the people who need it. MyWell delivers insights to smallholder farmers about the state of their groundwater. Promotes engagement at a local level. MyWell facilitates cooperation between farmers to ensure the future of their water supply. MyWell is a Smartphone and SMS app for tracking water data. The app works by crowdsourcing well, rainfall and checkdam readings from a network of volunteers. MyWell displays the current status of each well, as well as historical and village level data for simple comparison and analysis. When a voluneteer takes a reading from a well, rainfall station or checkdam, they can use MyWell to submit it immediately. Either with a Smartphone or over SMS, all they need to do is fill in a simple form. This eliminates the need to use paper based systems, and allows for immediate feedback for the farmers relying on MyWell. Once a reading has been recorded, anyone can access it at a later date for statistics and data analysis. Powered by a distributed data collection network, MyWell provides valuable insights to farmers. MyWell displays simple graphs; snapshots of the readings from a Well, Raingauge or Checkdam over the last 3 years. MyWell also calculates village level statistics. These statistics let farmers compare and benchmark their wells against one another. MyWell also has a host of tools to manage the MyWell system. Anyone can register a new Well, Rainfall Station or Checkdam - using their device’s inbuilt GPS to pinpoint the location. MyWell also has a ‘Banner Image’ feature. Each well can have a unique Banner Image - usually of the well and farmer - allowing for greater personalisation and buy-in from farmers. Finally, MyWell allows administrators to upload a large number of readings at a time. This allows an import of large amounts of historical data; increasing the immediate value of MyWell to the farmers. In the next phase, MyWell will be scaled from 10 to 100 villages, onto several orders of magnitude larger. This means making improvements to the features that make up the self-managed MyWell network. 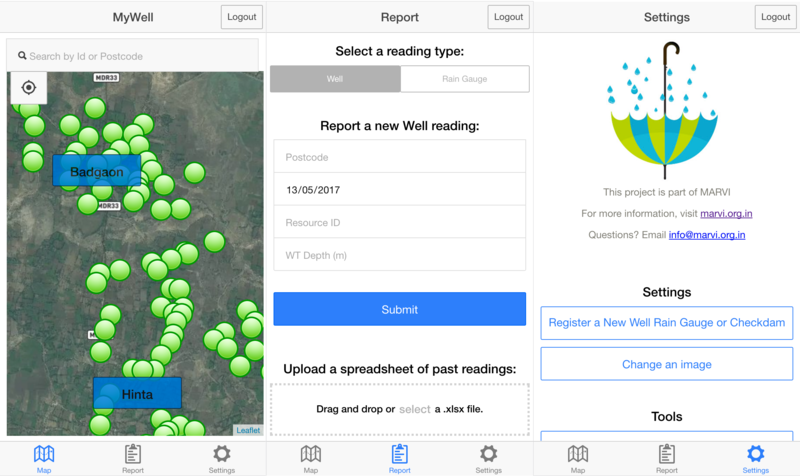 MyWell’s analytics and visualisation features will be improved to allow for better groundwater visibility for farmers. This will also help cater to the science and research aspects of MyWell and it’s parent project, MARVI as a whole. As far as app features go, MyWell needs to learn a few new languages; especially Gujarati and Rajasthani. The SMS features of MyWell are targeted for improvement - with modern Chatbot and AI technologies. The goal is to make interacting with MyWell over SMS easier and more conversational. A newly developed mobile application can come to the aid of experts looking to source data on groundwater level and create awareness about the issue among farmers. [Using MyWell], village-based Bhugarbh Jaankar (groundwater experts) will update groundwater level figures on a weekly basis… [covering] 250 wells in Dharta watershed in Rajasthan and 110 wells in Meghraj watershed in Gujarat. Data recorded in MyWell can help in quantifying the amount of water in our well so that we can plan according to less water dependent crops. Curious about MyWell? Or any of our other projects? Get in touch!